How do you teach your children to serve? How can you expand your women’s ministry to serve? How can you serve and be served in the midst of suffering? 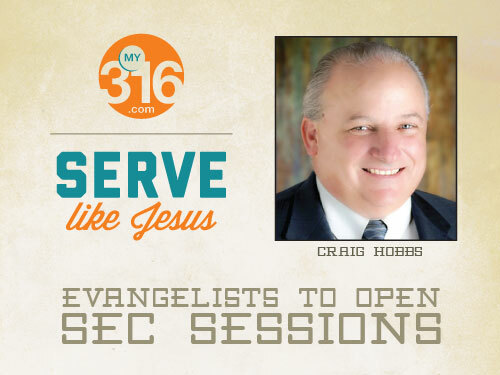 “Serve Like Jesus” is the theme of the upcoming State Evangelism Conference (SEC), and special breakouts and a luncheon will be offered specifically for women. The women’s breakouts and luncheon will be Tues., Jan. 29, as part of the SEC, Jan. 28-29, at Oklahoma City, Southern Hills. The luncheon begins at noon on Tuesday and features Lauren Chandler. Chandler, the wife of Matt Chandler, will share how their family was served when Matt was diagnosed with a malignant brain tumor in the fall of 2009. She also will give a brief testimony during the Tuesday afternoon general session. Matt Chandler is pastor of The Village Church in Flower Mound, Texas, which has more than 10,000 members at multi-campus locations. In an interview with The Gospel Coalition Voices, Chandler talked about the subject of suffering. “I think most of us associate the favor of God with living pain-free lives,” she said. “I believed this until the Lord graciously allowed me to suffer the loss of two miscarriages. He awakened me to the favor of His nearness in pain, the favor of being stripped of something desirous to see intimacy with Him and joy in Him as ultimate; to say with Paul that ‘I have suffered the loss of all things and count them as rubbish, in order that I may gain Christ.’” (Phil. 3:8). She continued, “What I’ve found to be so interesting is that there are plenty of people who are surprised when suffering comes, but also plenty who suspect it around every corner. Some believe that the Lord has positioned them on the anvil of suffering and is just waiting to bring the hammer of loss down on their heads. Tickets to the luncheon are $15, and must be purchased online prior to the conference. “Last year we sold out, so it’s definitely something women want to do now. We just can’t promise there will be space available to purchase a ticket on that day,” said King. Conference leaders include Amy Hanson, speaker, writer and consultant for senior adult ministry; Monica Rose Brennan, associate professor for women’s studies at Liberty University; Heather Keller, children’s consultant for national Woman’s Missionary Union; and Shelley Urton, BGCO women’s church consultant. “These are some of the best conference leaders from across the country, and women will have a unique opportunity to learn from them,” King said. Registration for the luncheon is available at www.bgco.org/women, or you may contact the BGCO women’s office at [email protected] for more information.